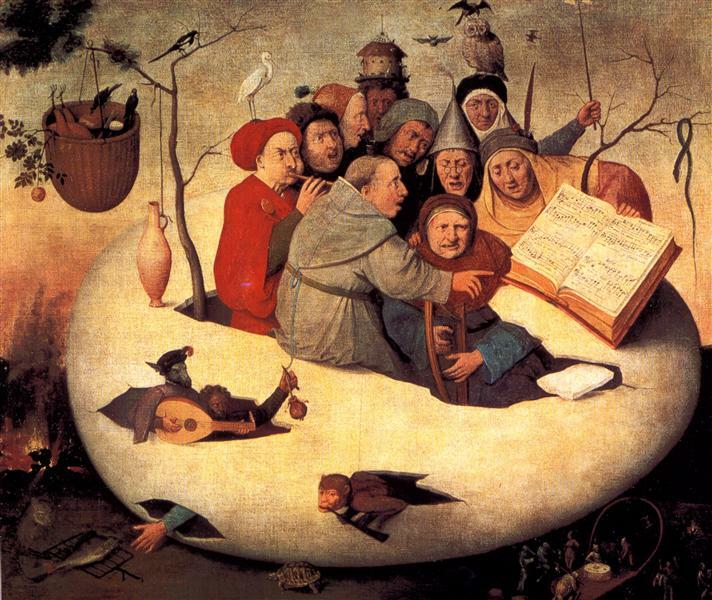 The Last Judgment is a triptych by Hieronymus Bosch, created after 1482. The triptych currently resides at the Academy of Fine Arts in Vienna, Austria. The outside of the shutters panel are painted in grisaille on panel, while the inside shutters and the center panel are painted in oil. The left and right panels measure 167.7 x 60 cm and the center panel measures 164 x 127 cm. 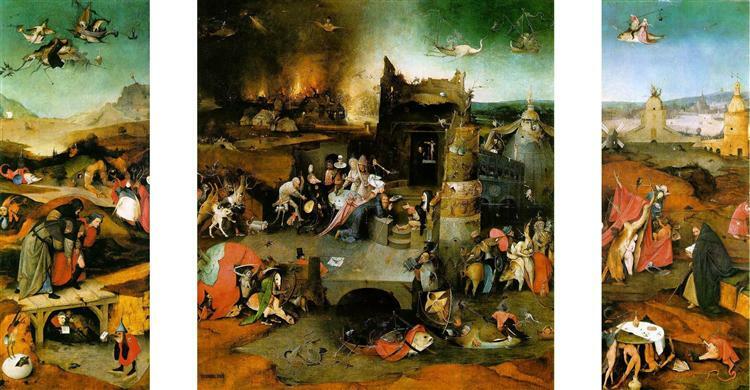 It is not to be confused with either a fragmented piece of art by Bosch under the same title (now at Munich), or another full painting by Bosch, possibly by a painter in his workshop. 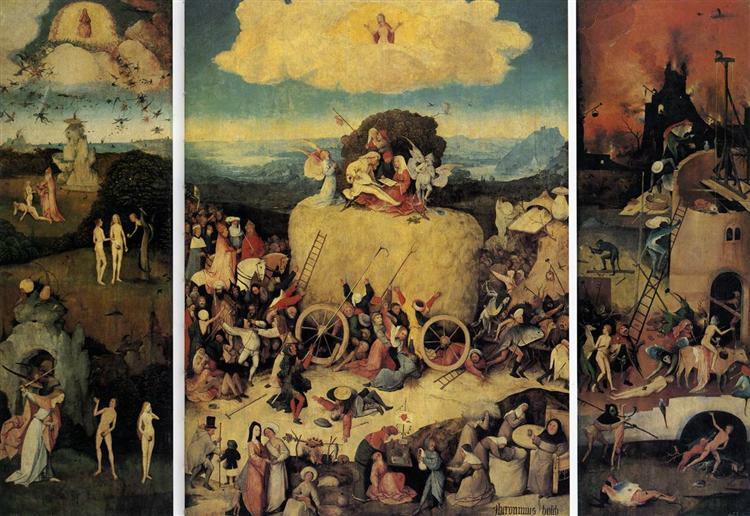 The left panel shows the Garden of Eden, at the top God is shown seated in Heaven while the Rebel Angels are cast out of Heaven and transformed into insects. At the foot of the panel, God creates Eve from the rib of Adam. 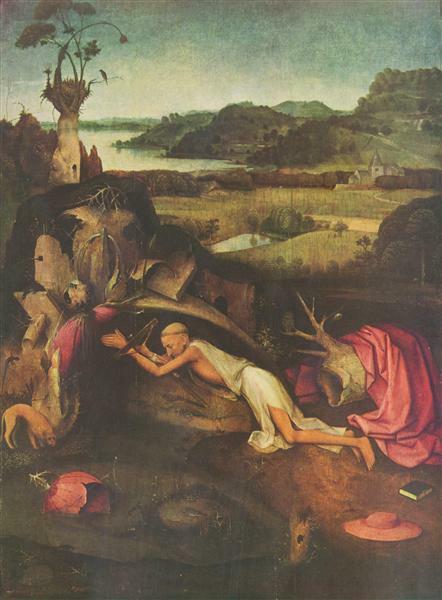 In the midground Eve is tempted by the Serpent, while the couple are finally seen being chased by the Angel into the dark forest, in the central panel where Jesus judges the souls while surrounded by the Saints. The right panel shows a hellscape, where the wicked are punished. 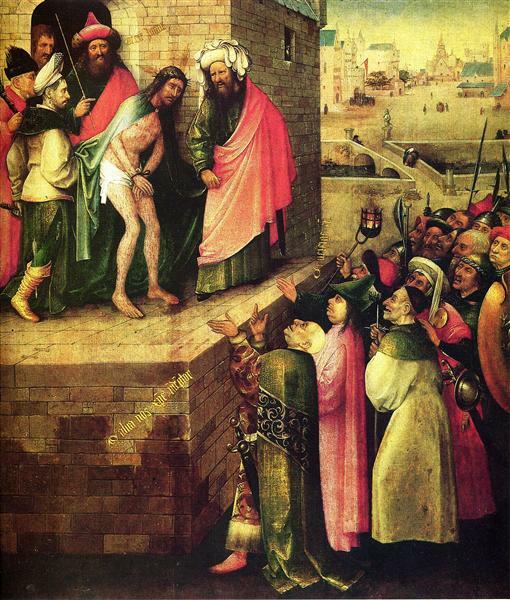 The oldest mention of the painting is in a 1659 inventory of Archduke Leopold Wilhelm of Austria's collection, as by "Hieronimo Bosz". In the late 18th century, the work was acquired by count Lambert-Spritzenstein, from whom it later went to the current location. In the 17th-18th centuries, the triptych has been widely repainted and has lost part of the colors. Some art historians identified this work as that acquired by Philip I of Castile in 1504, while others deny this. 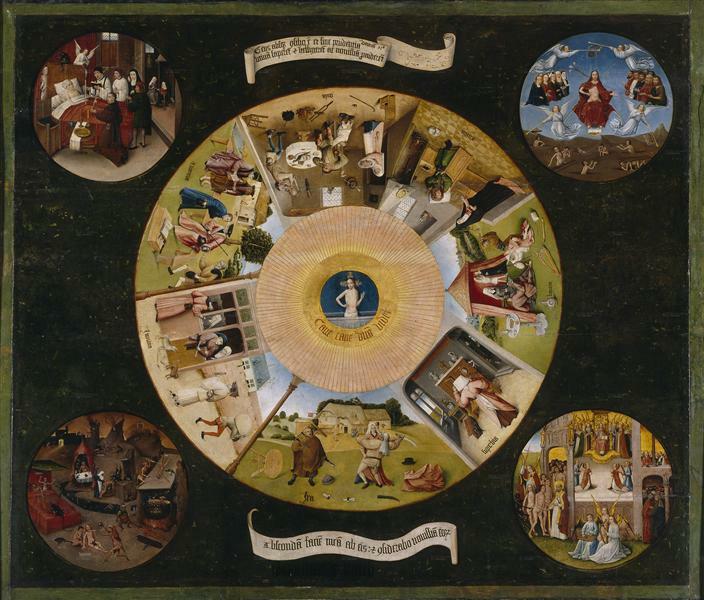 Dendrochronologic analysis proved that the painting was executed not before 1482 There is copy of the work, attributed to Lucas Cranach the Elder, in the Gemäldegalerie of Berlin. 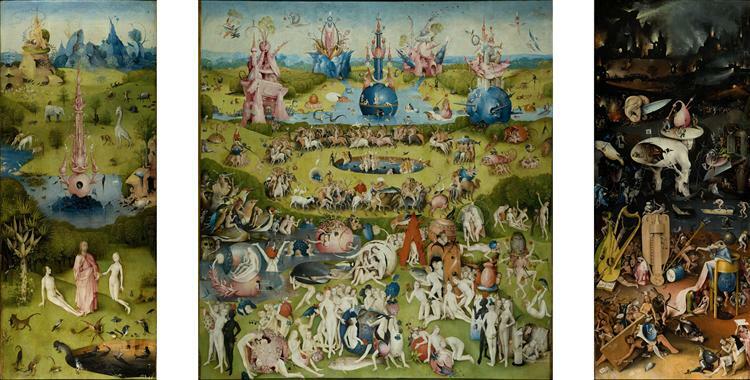 The painting's composition has similarities with the Haywain Triptych or the Garden of Earthly Delights: both also show the Garden of Eden in the left panel and the Hell at right. 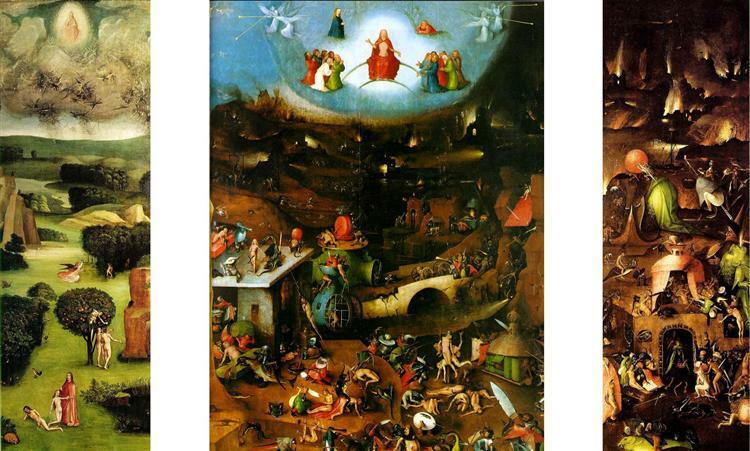 The central panel depicts a Last Judgement, in a more obscure atmosphere than the Hell one. Like in other contemporary Flemish triptychs, the shutters are externally painted in grisaille, depicting two saints. 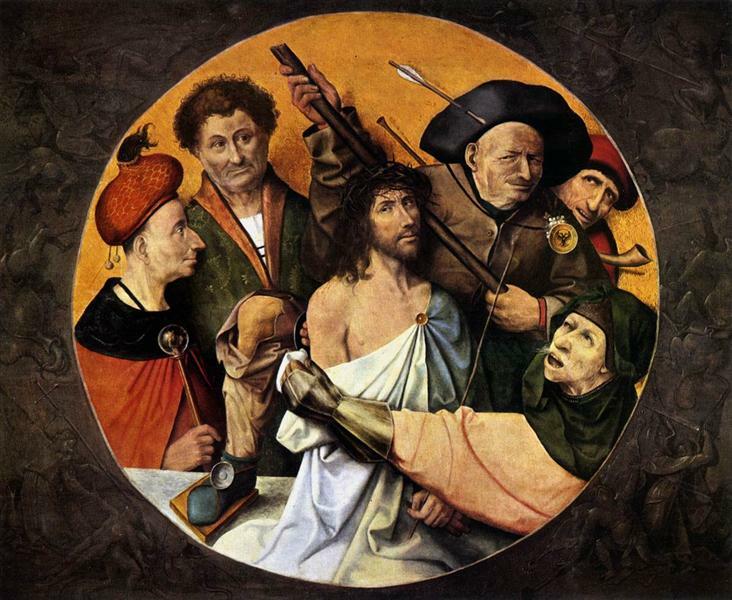 At left is St. James in pilgrimage within a wicked land with a hung man (perhaps a reference to some episode in the Golden Legend) ; at right is instead St. Bavo, the patron of Flanders, donating to the poor with his hawk on his left wrist. 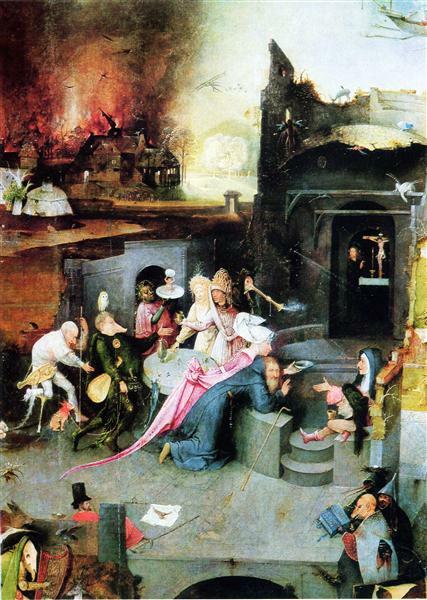 One of the characters in the latter panel, the old woman with a child, appears in a drawing attributed to Bosch, now in a San Francisco private collection. The left panel depicts the Garden of Eden of the biblical history, as a green landscape in the lower three-quarters. 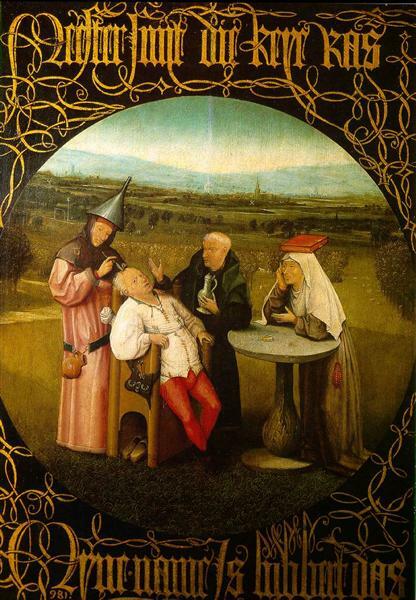 In the upper section Bosch portrayed God sitting on his throne, surrounded by a luminous halo. Around him is a cloudy sky, with angels fighting rebellious angels who are turning into devils as they fall. Below are, reading from the bottom, God creating Eve from Adam's rib, with Adam sleeping at her feet; the Serpent tempting Eve and the tree of the knowledge of good and evil; and, finally, Adam and Eve expelled from the Garden by an angel, who holds a sword, into a dark forest.